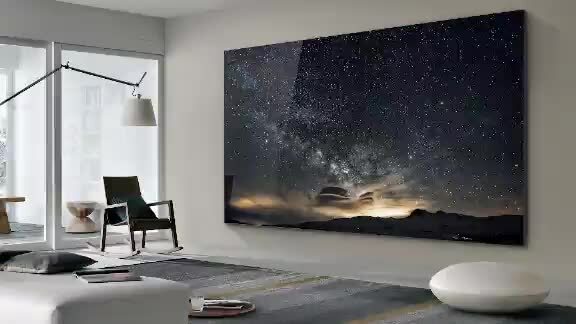 Samsung showed a massive 219-inch TV at the CES technology show in Las Vegas, CNN reports. That's a screen measuring more than 18 feet. If you're like many Americans, you probably wouldn't mind having a bigger TV. But how big is big enough? Called "The Wall," the TV uses a technology called micro LED, which creates a brighter image using less energy than current televisions. For those of you who think a screen like this is better suited to a stadium than a living room, a 75-inch modular version is also coming out. Sony, TCL, and Hisense are also showing TVs 75 inches and larger at the show.